It's been a little more than two years since Apple released a major update to the iPhone. I realize that some would say that the iPhone 4S that was released in October 2011 was a major update, but even considering its innovative features, the 4S paled in comparison to the fabled iPhone 5. This week is the big week for iPhone fans itching for the next big thing (myself included). Apple has announced an iPhone event scheduled for Wednesday, September 12. Here comes the iPhone 5! In today's Monday Morsel, let's take a few minutes to discuss the impending iPhone 5 announcement and five considerations for retiring your current iPhone. Because everything we know right now about the new iPhone is rumor, I'll focus less on what to expect from the new iPhone and more on what it means for your existing iPhone. For now, we don't know the capacity options that will be offered with a new iPhone. WIth each generation, Apple has increased the overall capacity to accommodate the improved photo and video quality, our expanding digital music collections, and the seemingly limitless appeal of apps. When you're deciding which iPhone to buy, think long term. Certainly stay within your budget, but when you're preparing to make that purchase, buy the largest iPhone you can afford. It will accommodate your usage and also retain more of its value over its lifecycle. A new iPhone invariably means new chargers (for your home, your car, your desk at work, etc. ), new cases, and possibly new "other accessories." For example, I have a Studio Neat brand Glif tripod mount and stand for my iPhone 4. If the rumored dimensions of the iPhone 5 prove to be correct, I'll need to replace it. This may seem insignificant, but in my opinion the cost of accessories should be a factor in your iPhone decision. They can quickly add up to quite a chunk of change. I'm mentioning that here in the spirit of full disclosure. Pass it along to a member of your family who is not yet eligible for an upgrade. Enjoy the non-phone uses of your iPhone. Use it as you would an iPod Touch for a member of your family who does not need a phone. For example, if you have a child too young for a phone, your old iPhone is a great introductory device! Unlock your out-of-contract iPhone and offer it to a family member or friend whose carrier does not offer iPhones. Probably the easiest option would be a turn it into Apple through their reuse and recycle program. If your old iPhone has monetary value, Apple will send you an Apple Gift Card. If not, they'll recycle it for you. From Apple it came; to Apple it shall return. Best Buy offers a similar program, although I'm not sure how the rates compare. But if you prefer Best Buy stores to Apple Stores, this may be the preferred route for you. You also could choose to sell your iPhone locally through online classified ads such as craigslist.org. Just be careful when using this kind of site. There are scams and scammers, so meet in public places only. And the market will surely be flooded with old iPhones, so your value may decline. The international alternative to Craigslist in eBay. An eBay auction is not difficult, but it involves more steps than a simple sale - and there are fees at just about every step. Lastly, there are many online sites that will buy your iPhone. They pay a fair price, although not top dollar. But it's quick, easy, and convenient. Go online, complete a form regarding the condition, get an estimate. Then ship the iPhone off (normally in a postage-paid arrangement) and you'll receive your bounty in exchange, either via PayPal or check. Two two consider are gazelle.com and buymytronics.com (which is affiliated with Game Stop stores). If you use your iPhone for everything, before you replace it with your next "Precious," remember to prepare your existing iPhone for its new life. That means formatting the iPhone in order to completely erase your personal data. Perhaps the easiest way to so this is to restore the iPhone from within iTunes. If you've been enjoying iCloud for untethered syncing, you'll need to pull out your old cable for this step! 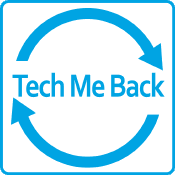 If you're considering a new iPhone, Tech Me Back will be glad to help you take that step. Don't hesitate to contact me if you have any questions!